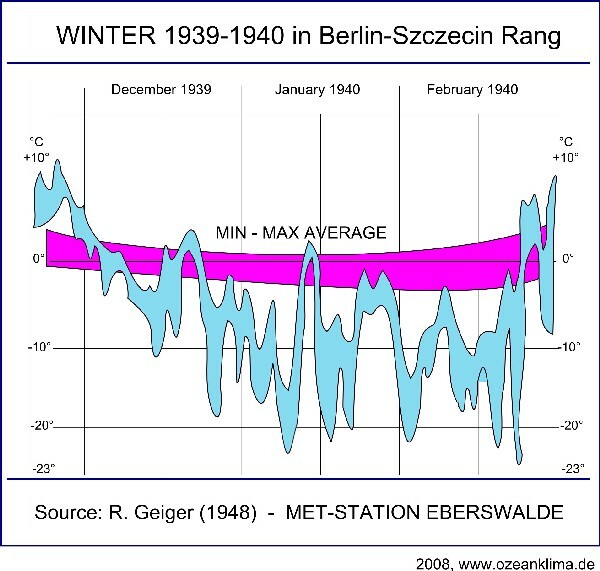 “We noticed this especially in the increasing mildness of the winters, which became more and more striking between 1900 and 1939, and surprisingly a series of three severe winters followed”, recalled M. Rodewald few years after the winter 1939/40 had taken reign (Rodewald, 1948). That was widely anticipated, but the term “severe winter” is rather abstract in order to realize the scope and intensity of the situation. Temperature is certainly the most important feature of winter, and it will receive the bulk of attention when talking about records. But there are other parameters as well, which should be taken into account when analysing a severe winter and trying to identify the role man played for this to occur. 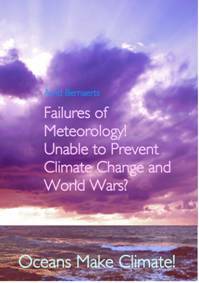 Before looking more deeply into this aspect, in the following sections, a brief overview of some temperature and weather observations made during the first winter in WWII will be discussed. 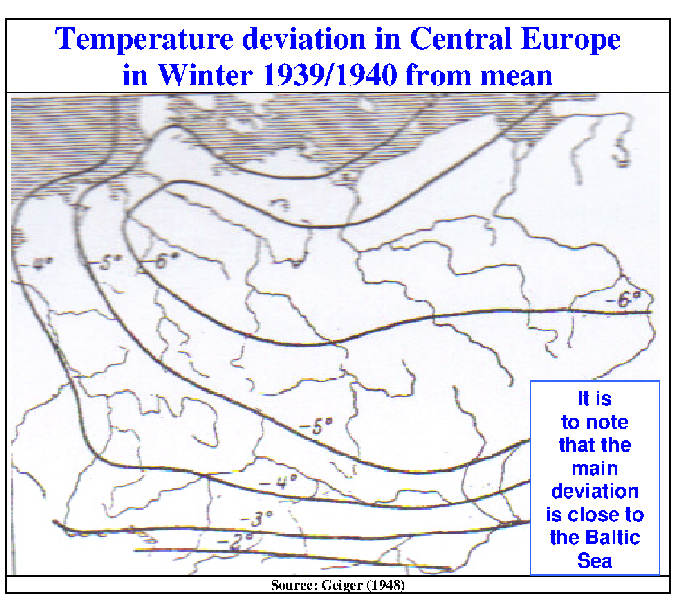 General Frost served Europe with three cold events of considerable intensity during the winter 1939/40. 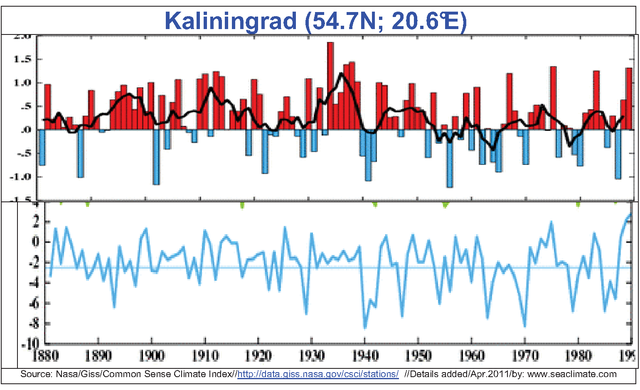 From a meteorological point of view, there was a fourth cold wave in the first half of March 1940, which can, at least partially, be attributed to the excessive sea ice cover in the Baltic. 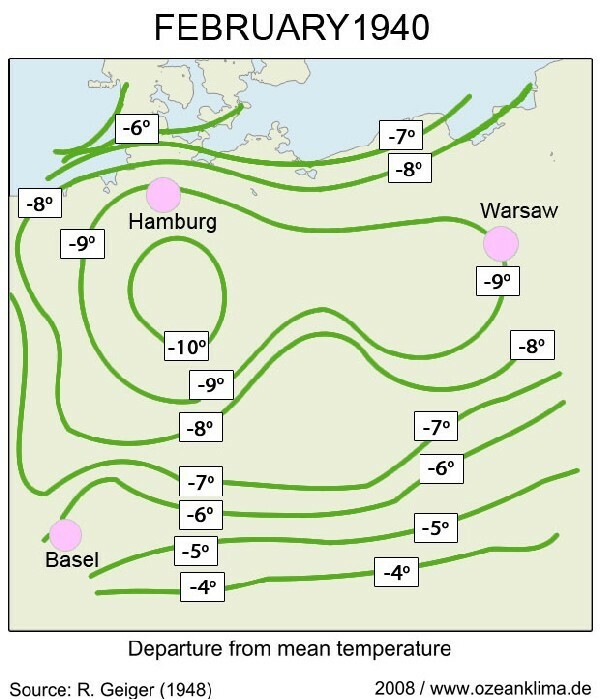 Presumably, the most stunning was the arrival of the third wave in mid February, which has already been mentioned in the pervious section (C1), and which resulted in temperatures of 9°C to 10°C below mean, across the region between Hamburg and Warsaw, see Fig. C2-2, p. 49. December 1939: All in all, December cannot be regarded as spectacular, at least not in Western and Central Europe . __In Great Britain the winter started off mildly, but it became cooler during the first fortnight of December. The first cold spell came during the latter half of December 1939. __On the German coast of the North Sea the first sea ice appeared around December 17 and remained there until the end of the winter. __In Berlin the winter started with freezing on December 8th. __A cold wave caught e.g. Gdynia , -17°C; and Klaipeda , -14°C around Christmas time. __In the last week of the year the temperatures varied strongly at many German stations, but dropped considerably during some nights, for example on December 29th: Aachen , -8°C; Karlsruhe , –18°C; Hanover , -14°C; and Berlin –13°C. December 24th 1939: Report by James Aldridge: “The cold numbs the brain in this Arctic hell, snow sweeps over the darkened wastes, the winds howl and the temperature is 30 degrees below zero (minus 34.4° C). Here the Russians and Finns are battling in blinding snowstorms for possession of ice-covered forests. …I reached the spot just after the battle ended. It was the most horrible sight I had ever seen. As if the men had been suddenly turned to wax, there were two or three thousand Russians and a few Finns, all frozen in fighting attitudes. Some were locked together, their bayonets within each other’s bodies; some were frozen in half-standing positions; some were crouching with their arms crooked, holding the hand grenades they were throwing; some were lying with their rifles shouldered, their legs apart….Their fear was registered on the frozen faces. Their bodies were like statues of men throwing all their muscles and strength into some work, but their faces recorded something between bewilderment and horror.” (NYT, December 25 , 1939). __December 30; Milan –10°C. during Saturday night. Genoa and Triest heavy snow storms (Neue Zürcher Zeitung, Dec. 31, 1939). __December 31; cold wave in Bulgaria ;, the lowest values at Rustschuk on the Danube River with minus 20°C. Banja Luka/Westbosnia: minus 27°C; in Slovenian cities minus 26°C. __ Dec. 31st 1940; The Atlantic island Madeira reports a violent storm on Sunday (December 31) with heavy flooding. (Neue Zürcher Zeitung, January 2 1940). __ January 11: Rumania , -40°C/-40°F. __ January 22: Severe snow storm swept Europe from the Arctic Sea to Scandinavia . __ January 29: ‚Icy Storm hits Britain , London has Heavy Snow’. __ January 31: ( UK ) Newspapers permitted to publish the first details of the blizzard, called it the coldest weather in a century. Moscow - Last but not least: It is to note that the coldest January ever recorded in Moscow is January 1940, during which also the lowest ever recorded temperature was observed with: −42.2 °C (−44.0 °F) (source: wikipedia/Climate of Moscow ). __ February 13; Copenhagen . The temperature has dropped to 13 degrees below zero Fahrenheit (-25°C). (NYT, Feb. 14, 1940). __ February 13; Baltic countries. In Estonia , Latvia and Lithuania more than 10,000 persons suffered severe frostbite. 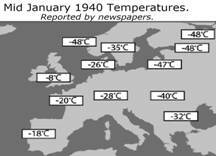 At least five persons froze to death in the three Baltic countries, where temperatures reached 54 degrees below zero Fahrenheit (- 47.7°C) recently for the first time in 160 years (NYT, Feb. 14, 1940). __ February 20, 1940; In Sweden all cold records were broken in the last twenty-four hours with 32 degrees below zero Fahrenheit (-35.5°C), the coldest since 1805. The previous record in Stockholm was 22 F degrees below zero. Copenhagen tonight 2 degrees above zero Fahrenheit. (NYT, Feb. 21, 1940). Too little and too much rain. The war started with a very annoying lack of rain for Poland , which the military had expected to defend their country against the German invaders because of mud and impassable roads. Instead, it rained heavily in Western Europe, from Wales in the UK to Bavaria and Austria at a number of stations above average by 200% in September, and sometimes 300% in October and November. Also the USA experienced contrasts between heavy rain and high dryness (see TM5, p. 59), which raises the question, whether a too dry Northern Hemisphere paved the way for General Frost to increase his influence in regions outside the Arctic during the forthcoming winter. More details in a later section. A shift of wind over northwestern Europe. In autumn there was a great wind shift from usually south-west to north-west, which resulted for England in a mean wind direction from the north-east quarter for the entire winter 1939/40, the only one of three since 1814 (more at: C5). It was not the first time that the daily weather analysis had given an indication about the weakness of the WWD in autumn 1939. This was, in close relation to other weather events, a strong indicator of the involvement of war in general, and of naval war in particular, in the running of atmospheric processes, and will receive further attention (more: C5). The cold arrived in Dresden on December 6th , 1939 – An example. At Dresden there was massive snowfall between December 6 and 8, depositing snow up to a height of 25 cm (corresponding to a melted water amount of 50 liters per m²) after 36 hours of uninterrupted snowfall and a temperature drop to -7° C. Few weeks later Dresden recorded the coldest January in 112 years (Naegler, 1940), but it may have been even longer; as the records had only been made since 1828. The drama under the Polar Circle. 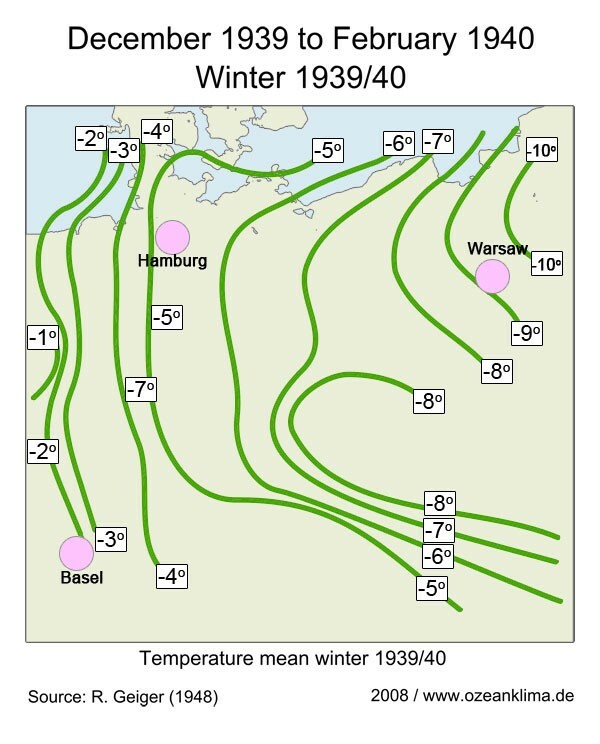 It is presumably one of the best documented WWII events in Europe, the so called “winter war” between the Soviet Union and Finland from November 30th, 1939 to March 12th, 1940, at the excellent website: http://www.winterwar.com/, including a detailed meteorological history. The Karelian Isthmus experienced a record low temperature of −43 °C (−45 °F) on January 1, 1940 (http://en.wikipedia.org/wiki/Winter_War). The military clash was murderous, most of the time under a dark sky, and with hardly any sunshine. Fighting cost the Russians about 125,000 men, plus 264,908 wounded, and they lost more than 2,000 tanks and numerous other war machinery. 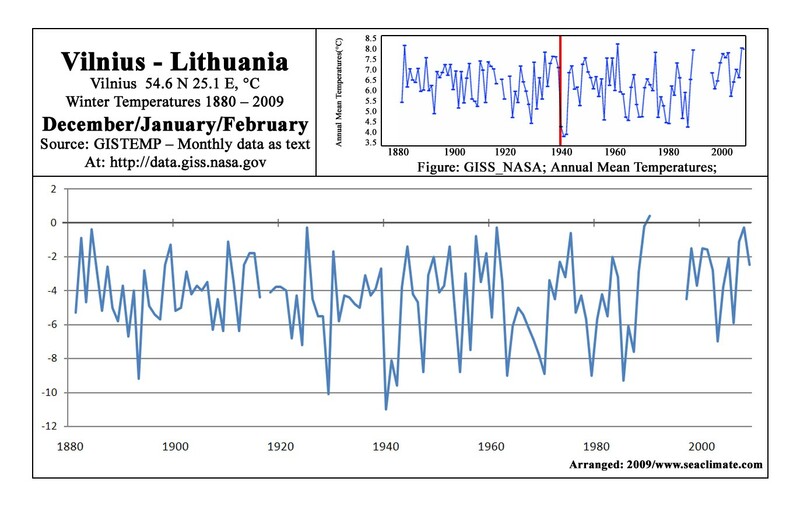 When it all started the extreme winter had already been advancing, but it is unlikely that the “winter war” did not also contribute to that, and so did naval warfare waged in the Eastern Baltic. The clash in the north needs a more detailed presentation. (see below: C6). Headline to a brief text in NYT (Jan. 19) - Europe in mid-January 1940. “Cold relaxes its grip on North Europe . Only Finland still suffers in 58-below-zero weather, a 60-year cold spell. Schools in the Reich closed. Low temperatures, sleet and snow in Portugal , Spain and northern Italy . __Snow storm lasting from 26th to 29th, vast areas covered with snow, high snow drifts, e.g. Exmore 2,5m. Main drift between Ringshall and Dagnall (near Luton ), 15 feet/4,57m (Hawke, 1940). __Ice-storm. The duration of the storm was remarkable lasting up to 48 hours in some places. For instance at Cirencester, 48 hours of freezing rain fell in temperatures of between -2° and -4°C. This is an exceptional event in the UK , and that of 1940 is reckoned to be the severest that has struck the UK in recorded history. It is also claimed that the harbors in Southampton and Folkestone were frozen, as well as the Grand Union Canal between Birmingham and London . In close vicinity of London the river Thames has frozen for the first time since 1814. (Neue Zürcher Zeitung, January 29, 1940). The brief chronicle illustrates for what Adolf Hitler and his consorts should be held responsible. The extreme conditions were not mere ‘natural variations’ but a special force must have goten upper hand: Unfortunately the weather services did not see anything, they ignored any signs, and demonstrated how little they understood about the mechanisms that drive weather. Even during war time, this ignorance is difficult to accept. Most of the referred data were published by the newspapers often within one or two days. These data may not always represent the correct figures, but they did draw a fairly correct picture about the stunning winter story. The New York Times is a miracle in this respect, and it is not only outstanding to read, but a very rich and valuable source of historical weather research. The marvelous job The New York Times did, cannot be appreciated highly enough. Their reporting was outstanding, excellent, comprehensive, detailed and prompt.